Today, people are more eager to keep at least one fish in their homes. Fish keeping has become one of the favorite hobbies of people. But most of them often face problems when it comes to feeding their fish. The people find it hard to feed right amount of food or feed on time, or to make proper feeding arrangements when they have to be away from their homes for days. But the invention of automatic fish feeder has solved these problems. The automatic fish feeder is designed to feed the fish automatically by releasing the right amount of food at particular time intervals. This device can be fixed to the aquarium, mostly on the top position. This device either run on battery power or electrical power. Some can use both these power sources. Normally, this has a container which is divided into numbers of small cells. The number of cells may vary from 8 - 28. In these cells, you fill fish food. Some devices provide an option to fill the container with different varieties of food at a time. You can even provide medications to the fish using this device. The next feature is the timer through which you can set a particular time to release the fish food. There is an LCD screen which helps you to set the feeding time, a number of feedings in a day and in some devices, it displays the amount of fish food left in the container. An automatic fish feeder can usually feed up to four times per day. Some of them can feed up to eight times per day. There are few which can even feed up to one month. Some automatic fish feeders face food clumping problems. Clumping happens when cool air enters the cells and damps the food. As a result, the food gets clumped and it will stick to the cells instead of falling into the tank when released. To counter this problem, many automatic fish feeders have a stir bar which prevents clumping. This is what an automatic fish feeder is and this is how it works. Nowadays, these devices are in great demand and it is not an unusual thing since they offer many benefits to fish keepers. Now, the manufacturers are working hard on to improve the product. You can have a look at automatic fish feeders of different brand names if you visit the author's website automatic fish feeders. With the world going after everything automatic, even fishes want to have their utilities to be automatic! And seriously enough, why should the fishes be left behind? You can’t really give the same amount of feed every time. Feeding fishes manually has this drawback where the amount of feed given is purely based on approximation. And fishes as we all know are a greedy lot. They do not know when to stop and can go on eating until everything you gave is exhausted; they might even die due to overeating. In case you’re out for work, who will feed your fishes? You don’t really expect your dog to do the job for you; or do you? Even when you’re not out for a long period of time, feeding fishes at regular intervals becomes next to impossible especially if you have a job that has no fixed working hours. Automatic fish feeders are not only for the aquarium but are for the ponds too. Actually, this concept of automatic fish feeding came from the ponds and has been in use for a long time. Only recently, it was inducted for domestic use in aquariums. The advantages of using an automatic fish feeder are many. 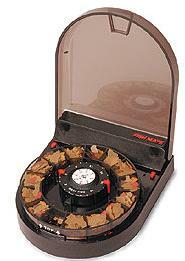 Number of Feeds: Some advanced feeders have the capacity to provide your fish with food up to 8 times a day! Surely, there are fishes which eat less but eat frequently! You can vary the number of feeds depending on the type of fish you have. The bigger number feeders are suitable for use in ponds and other large areas. Type of Feed: With greater advancements in technology, fish feed comes in pellets, flakes or in the crumbled form. Earlier there was a problem in providing the desired type of feed for the fishes. But now, the dispenser opening comes in a universal size which allows the easy dispensing of almost any size and shape of the feed particle. Holding Size: You may not require a large holding size of the feed for domestic and small aquariums, but with larger fish breeding water bodies, the holding size also increases. The popular ones can hold weights of 50 grams of food. The hopper is also an integral part of the holder and provides easy feed to the aquarium. Avoid Moisture: The big problem with fish feed is that if it comes into contact with moisture, it gets spoiled. Modern automatic fish feeders can hold feed in the absence of moisture. Automatic feeders are the next-gen aquarium utilities that help you administer the right amount of feed for your well-kept fishes. No doubt that these are great investments for your aquarium and the fish. The fishes are no longer crying foul!